Note: The erroneous release date of April 14, 1911 was given in an advertisement in the April 8, 1911 issue of Moving Picture World, which transposed the release date of this film with the next. "The tale of one boy's change from the former to the latter, and another boy's change vice-versa. Neither youth was forced to the change by circumstantial condition, by fortune good or fortune bad, by financial gain or financial loss, but by plain love of adventure. And, through the transformation, they adventure to their hearts' content - and more - through the odd finale on the screen." "A wealthy young physician, a widower, lives in a beautiful mansion with his only child, a boy of seven. The doctor's practice is exacting, despite his great love for the boy, he is necessarily forced to entrust him to servants, who, while not cruel, are naturally neglectful and indifferent. Like all children of his age little Paul has dreams of the future. He did not want to be a milkman or a pirate, but his ambition is to run a peanut stand, and twirl the jolly little roaster. While walking in the park one day, his nurse permits him to wander away while she flirts with a policeman. Then Paul's dreams are realized, for he finds a peanut wagon, presided over by a delightfully dirty little boy, who from Paul's standpoint should be the happiest child in the world, but, strange to say, he isn't. "Paul admires the roaster, and the other boy admires Paul's fine clothes. Childlike, they agree to swap. The boy dons fine linen for the first time in his life, while the rich boy is thoroughly happy and gives the peanuts the twirl of their lives. Trouble quickly follows. The neglectful nurse, missing her charge, suddenly appears, grabs the well dressed child, and hauls him off. It is a good joke for Paul, but when the drunken owner of the stand appears and whacks his 'little boy' laughter gives way to tears. The two youngsters look much alike, and for the time neither guardian notices a substitution. The poor boy in the rich home is scared to death and very uncomfortable, his only joy being the fact that there is an astonishing amount of food. The rich boy finds that peanut vendors have brutal ways, and decides to run away. He fails at first, but finally gets out of the house with the padrone close behind him. The boy, through terror, and the padrone, because he is half stupefied with liquor, failed to notice that they had run directly into part of the road where a blast is being set off. The man is killed, and no one mourns him. The child is injured and taken to the hospital, where he is cared for by a sweet-faced nurse. There his visiting physician calls and recognizes his own child, who he thought was safe at home. "The nursemaid, in the meantime, has discovered the substitution, but is afraid to tell, hoping that she can recover her lost charge before the matter is found out. But her efforts are unavailing and she is turned out by the indignant father. The rich little boy and the hospital nurse intercede for the poor little chap, and the doctor finds a place in his home for him, while the nurse, who has won the hearts of both children, agrees to act as housekeeper for the home that needs a guiding hand of a loving, self-sacrificing woman. So perhaps Cupid entered the house at the same time as the poor little friendless boy; who knows?" "This pleasing little story is instructive as well as amusing and has the ever welcome quality of being true to nature. The acting and scenery are good, and the acting especially deserving a praise. The six-year-old son of wealthy parents is growing tired of his many toys and longs to live in a natural manner. The park policeman having engaged the interest of his nurse while she and the boy are out walking, the youngster runs off. Discovering a peanut vendor's son the same age as his own turning the crank on the peanut roaster, he trades him the velvet suit he is wearing for the job of turning the crank. The nurse finds the peanut vendor's son and, mistaking him for her charge, takes him home and puts him to bed. "The peanut man also mistakes the boy at his machine for his own and takes him to his hut, where he so mistreats the lad that he runs off the next morning. The man follows, and while running past a place where blasting is going on the man is killed and the boy stunned and taken to the hospital. His father is a regular physician there and on his daily round recognizes his son, whom he takes home. The nurse is discharged and the father orders the other boy taken away. 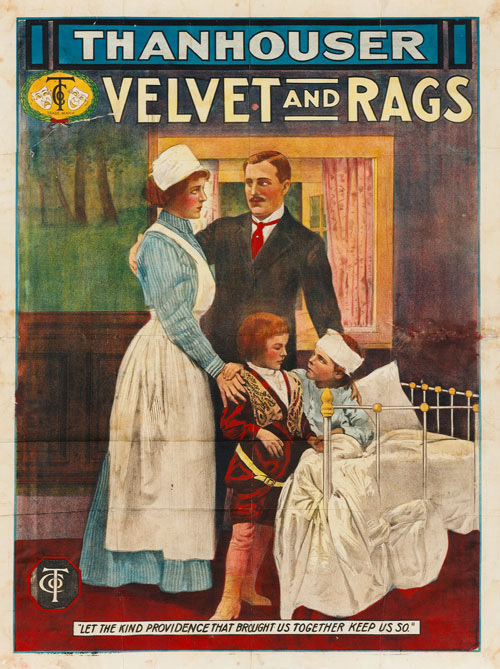 A nurse who has come from the hospital interferes as well as the physician's son and he is allowed to remain, and both the boy in velvet and the one in rags are made happy." "A sort of modernized 'Prince and the Pauper,' this story of the Thanhouser Company is entirely creditable to the producers and shows considerable forethought in its presentation. The scenes are all noteworthy in their attention to the smaller matters of harmonious decoration and arrangement, and the exteriors show careful selection, particularly the one showing the men at work in the excavation. This could hardly have been better taken. The acting of the two children calls for commendation. They are decidedly clever players, and the facial resemblance between them is remarkable." "This reel gives a well staged-well acted photoplay, detailing the experiences of two discontented youngsters. It is boy-like for the scion of a wealthy family to want to operate a peanut roaster. It is human for the son of the peanut roaster to sigh for the enjoyment of wealth. They change places and both wake up to what is unpleasant in the situation about the same time. Eventually they both get into the big house and get what they both lack, namely, love and sympathy. The story is well told and none of the episodes are impossible. The mechanical work is well done, while the acting of the two boys is pleasing." "The Thanhouser little girl makes an excellent little boy in this appealing little story, rendered doubly so by capable acting. While in the park the physician's active young son strolls away from his nurse and changes clothes with another small boy who roasts peanuts for an Italian vender. The nurse in her excitement does not notice the mistake until some time after, nor does the Italian, who is then determined to keep the youngster. He, however, escapes the next morning and runs into a blast, pursued by the Italian. He is taken to the hospital, where he is recognized by his father, who without examining him takes him home, to learn that the nurse has been keeping the secret of the exchange until the boy should be found. On the nurse's plea the other little fellow is permitted to stay as a companion."